As we leave Carlo Creek, we pass a man unconscious or dead at the side of the road, presumably a casualty of last night’s savage Alaskan hedonism. A sacrifice to the Gods of No Tomorrow. Things got pretty hairy and it seemed inevitable to me that not everyone would make it through to morning. His sleeping bag is soaked and so close to traffic that the cars and trucks blazing by, a foot or two from his head, send wave after wave of oily road water cascading over him. He doesn’t move or flinch when they go by. Is he dead? I hope so, for his sake. His suffering will be less that way. 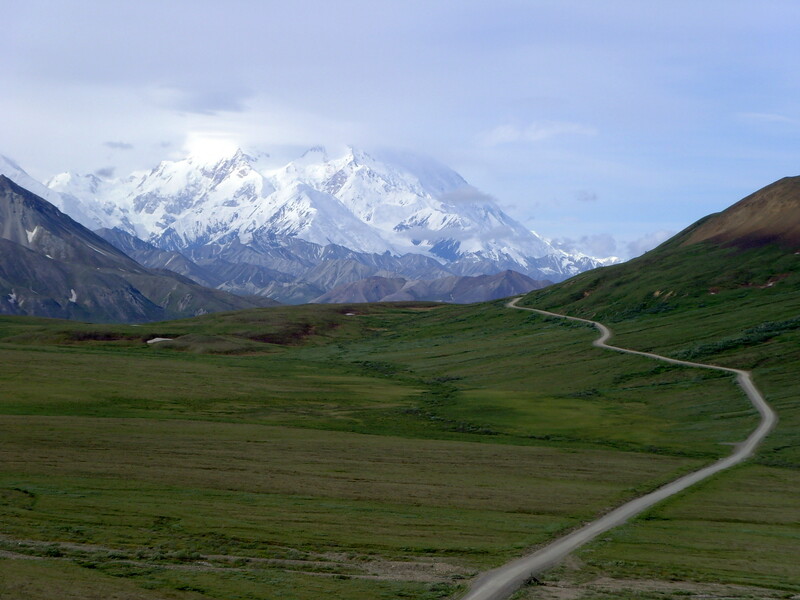 The end of Denali began with the road. 6:30am. We arrive at the Wilderness Access Center in good time for the Denali Park Road shuttle to the Eielson Visitor Center. My secretary had packed a day kit: extra clothing layers, medical supplies, headlamps, hunting knives, firearms, small explosives, lunch and a flask of tea. You can never be too prepared, especially when contact with members of the general public is anticipated. On board and we begin the four hour journey west into Denali National Park. Building a road into Denali is like building an escalator up Everest. It’s only a matter of time before the world’s highest Starbucks opens for business. Perhaps the altitude will mask the low quality of their product and dramatic failure of their ideology. But Denali is vast, six million acres of vast to be precise, and the want of the many is great. Even the full 92 miles of Park Road barely scratches the surface of it. What choice do we have? How else will people like us get things we do not deserve? So we took the shuttle. We would be backpacking if we were not everything wrong with the world. But we are petroleum based parasites; it is our nature. We will see a fraction of Denali, but the spirit of our adventure will be dulled. Shot to death in the teleface with a bus schedule and a curfew. Our journey will not be a spiritual one, nor one of discovery, for that matter. Knowledge always comes with a price and we have made no sacrifice to the Gods of No Tomorrow. Not like the Athabaskans, not like Sheldon and even the Kantishna gold miners at least put everything on the line for their suicidal greed. Which leads me to wonder: is greed more acceptable if you are willing to sacrifice your life for it? It sounds better. Motivated. Goal orientated. Like you would have to work really hard to get all dead like that. Maybe if you can quantify greed with something so costly, it ceases to be an act of ego. The pointless arrogance of doomed narcissism becomes a statement. An abstract defiance of context. Like a piece of sad art or Starbucks that nobody asked for. Miles of pristine wilderness fly past. Even through a dirty bus window it’s spectacular. Ferocious mountains, ancient glaciers, majestic rivers; every turn in the road reveals a sight more impressive than the last. The pinnacle of the park is Denali: The Great One. Technically the tallest (but not highest) mountain in the world. 20,000ft of unforgiving and unrelenting granitic pluton. So huge that it has its own weather system. It straddles land and sky like a gluttonous horizon eating hellion. The weather is on our side today and we get to see both the north and the larger south peak. Our driver tells us that only about 20% of visitors get to see both peaks. We delight arrogantly in our inadvertent fortune before he goes on to tell us that six people have died attempting to summit Denali in the last two months alone. The continuing sacrifice to the Mountain God of No Tomorrow. Still, we are the 20% that get to see both peaks and isn’t that what really matters? Along the road we pass the eponymically excellent Geode Mountain and I Scream Gulch before we stop at the Toklat River Contact Station. Originally intended to be a temporary structure before the Eielson Center was built, the tentative Toklat tent held up against the brutal Denali winters better than anyone had expected, and so it remained. Toklat River itself is another Denali masterpiece. Complex study of fluid dynamics or insane army of murderous sinusoidal sound waves rendered impotent 2D by transcription; it all depends on which side of your brain you look at it from. 10:30am. It feels like 5:00pm. We arrive at the Eielson Visitor Center. Gripped by the sudden need for elevation, my secretary and I decide to hike up onto Thorofare Ridge, just north of the visitor center. It was easy trip and we reached the top of the ridge in less than an hour. The further along Park Road we travelled, the bigger Denali appeared, but from Thorofare ridge it is really put into perspective. It must still be an easy 50 miles away from us, but it dwarfs peaks in the Alaskan and Outer Ranges that are within a mile of us. It looks tantalisingly close – it really isn’t, but it’s enough for us to pick out the peaks: Mount Koven, Brooks and Deception. We sat alone on Thorofare Ridge as the savage tragedy of nature’s brutal indifference plays out below us. We are very small and the wilderness does not care if we live or die. On this scale, distance becomes academic. Miles and acres cease to be discrete and quantifiable integers. We attempt in vain to calculate the impossible infinity in front of us while we eat our sandwiches. We leave Eielson at 12:35pm. East returnings to the park entrance. Polychrome Mountain; a rusty cascade of volcanic yellows, oranges and browns. We decide to make time for an hour of scrambling across its crumbling magma ridges. It’s fun and precarious, but we soon spot a vehicular shimmer on the road in the distance. Another bus is coming. We tumble down to Polychrome Pass on disintegrated ridge and vesicular outcrop. Igneous shivs shred our clothes. My secretary manages to stay upright, but I plummet gracelessly downhill, deposited in a plume of loose soil at the side of the road just as the bus opens its doors. Gravity hates me. Covered in dirt and tattered clothes. Play it cool. A cloud of dust fills the bus, pre-empting our arrival. Nonchalant nod to the bus driver. Every step we take down the narrow aisle covers another row of passengers in our muck. Cough, cough. Silence. These are the worst kind of tourists. Worse than the hypocrites we are. This is a busload of hysteria and the situation is volatile. These are the tourists that get robbed and eaten and the world is better for it. Denali makes us greedy. 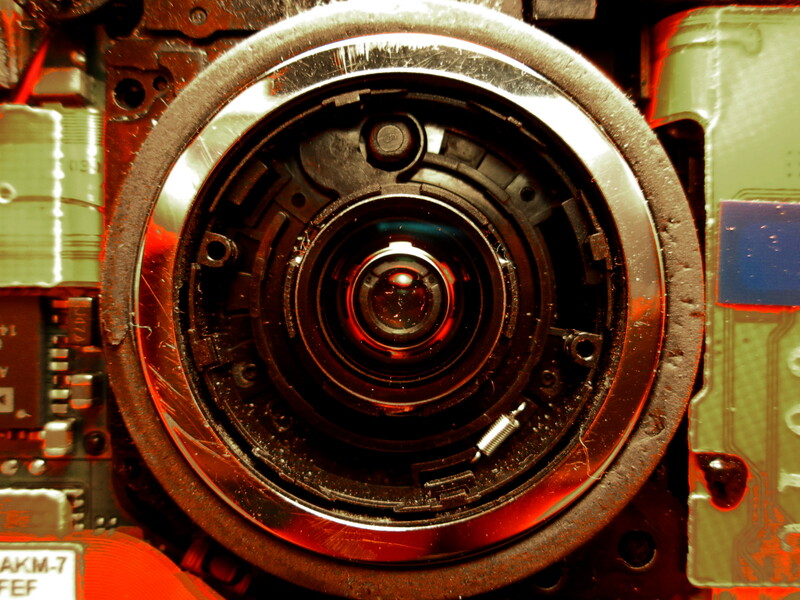 We are all collectors, bucket list tickers and shutter thieves here. And we work against the clock. But everyone has to take a break at some point. Bluish haze of dream. Smoke. Long pause. And then came the scream. Fluffy images of Nintendo and drum machines shattered. Torn from unconscious. I knew this would happen. The scream that resonates my eyeballs and fills me with dread and loathing. All hell breaks loose. Frenzy sweeps the bus like fire. People are running around, fumbling and lost in panic, stepping over each other in a desperate bid to arm themselves. The beast is in their sights. They push infants and the infirm aside for the perfect headshot. You know, the one that will impress all their friends back home. Shutters fire like machine guns as the thieves devour the beast with insatiable drooling lens holes. I fight the good fight, but my personal space and disapproving glare is no match for the pitiless barrage of elbows and shoulders. The world is full of idiots. And the ones who aren’t idiots are insane. A child’s hand reaches out from the pile of bodies on the floor. A final, despondent plea for help. The beast glances at us without interest and walks away unscathed. A grim silence falls over the bus. The true nature of the human has been exposed. Your photographs are not bullets. The only victim of this assault is our own dignity. At some point in the not too distant future, the things we saw in Denali today will be myth. Tales of mountains and glaciers will be told in the coffee shops of West Buttress St and Kantishna Hills shopping mall. Old men will say things such as ‘This is where wild caribou once ran free’ or ‘I remember when you could see the sky from here’, to which children will reply in unison ‘Yeah, whatever grandpa. Now give us your wallet or we’ll stab your face off!’ before disappearing into the grey streets of the City of Denali under flickering neon billboards for the world’s highest Starbucks. The city began with the road.